This item ships direct from the manufacturer only to the US, Canada and UK. Covers accidental physical damage or wearing off of the QR code up to one year. Does not extend to matters of cosmetic scratch or imperfection that occur as a result of reasonable use. 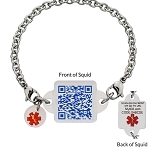 Interchangeable bracelet and necklace attachments connect to your online medical information when the QR barcode is scanned with a mobile device or the URL printed on the back is accessed. Emergency contacts are optionally alerted. The powerful "Square Deal" profile is included for FREE for the first year. Where Do I Enter My Profile Information? When you receive your Squid Square, it will arrive with instructions on how to access the My ID Square web site where you will enter your information. Squids are available in many color styles and bracelet chain is available is several wrist sizes. Squids connect to your online medical profile and optionally alert emergency contacts by text and/or email. 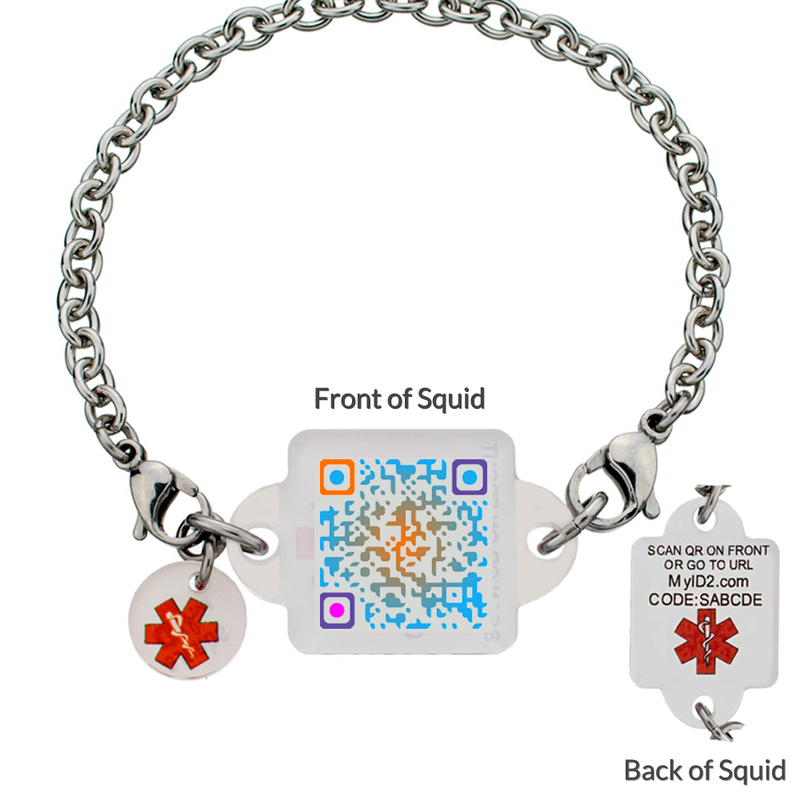 An EMT, good Samaritan or medical care provider can access the medical profile by scanning the QR on the front of the Squid with one of the thousands of free APPs or by going to the URL found on the back of the Squid. Squid Squares are 100% waterproof. You don't have to take them off to swim or bathe. All Squid Squares come with a stainless steel bracelet. Swap out your Squid Square with our other fun and beautiful Squid Square accessories. Be sure to measure your wrist to get the correct size bracelet for you. My ID Square does not recommend that you attach Squids onto keychains as keys can scratch the surface over time, making it difficult to read. Designed by a team of doctors, EMTs, nurses and patients, the "Square Deal" subscription includes an unlimited amount of information and alerts your contacts in an emergency. The first year is free and after that The "Square Deal" is just $25 a year. If you choose not to subscribe to the "Square Deal" after the first year, your subscription changes to our "Basic Deal", which is free, and includes a limited amount of information.